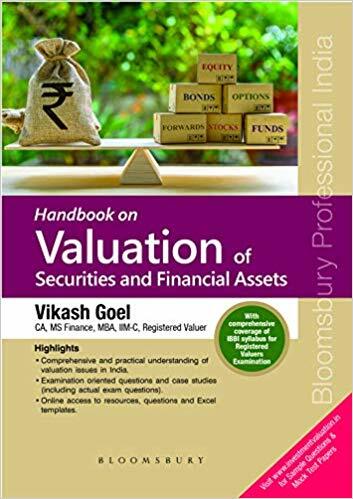 This book is designed keeping in mind the dual needs of a professional who is preparing for the Registered Valuation Examination and a practicing or aspiring valuer. The book would be immensely useful for the chartered accountants, company secretaries, lawyers and management professionals (e.g. MBA-Finance) while undertaking the valuation examination as it gives the provisions of different statutes covered under Valuation examination syllabus in a summarised manner. Key Features: Comprehensive coverage of following valuation concepts and topics covered in the exam: – Finance and Financial Statement Analysis. – Overview of Valuation. – Fundamental analysis of a business. – Valuation of Equity, Bonds, Derivatives and Other Financial Assets. – Valuation in special situations such as Mergers and Acquisitions, Private companies, young and start-up companies, intangibles and others. – Companies (Registered Valuers and Valuation) Rules, 2017 (updated up to 4th Amendment). – General Laws covering Contract Act, Sale of Goods Act, Transfer of Property Act, Income-tax Act, SEBI, FEMA, Companies Act, Insolvency and Bankruptcy Code among others. – Laws and Regulations relating to Valuation such as Ind AS 113, Valuation Standards, SEBI, Income -tax. – Case Studies. Simple language and concise presentation of content. Close to 1000 Examination oriented Practice Questions, including actual exam questions and Mock Question papers. Examination oriented Case Studies, including actual case studies. Access to premium online resources and Excel Templates for valuation.